The English rubric says that this prayer can be used to deliver a woman safely from the dangers of childbirth; that it was composed by St. Peter; and that he granted to everyone that says it a year's pardon. 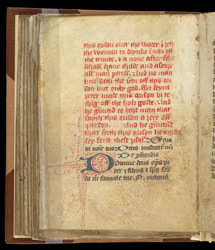 The Latin of the prayer is written with feminine forms of words, indicating that it was intended to be read by a woman. The original text of the manuscript refers to the Carthusian order (f. 73r), and the calendar includes, as an addition, the Dedication of the church of South Molton, Devon, which suggests that it was owned in the parish at some point.